Welcome to the 2019 Spring/Summer Season! Wasco Girls Fastpitch Softball registration for the 2019 Spring/Summer season begins January 1st. WGFSL is a well respected recreational softball league celebrating our 31st year. Registration is open to all girls’ grades kindergarten through 12th grade. Fees are the same regardless of where you live - no "out-of-district" fees. Players develop their skills with the emphasis on FUN! 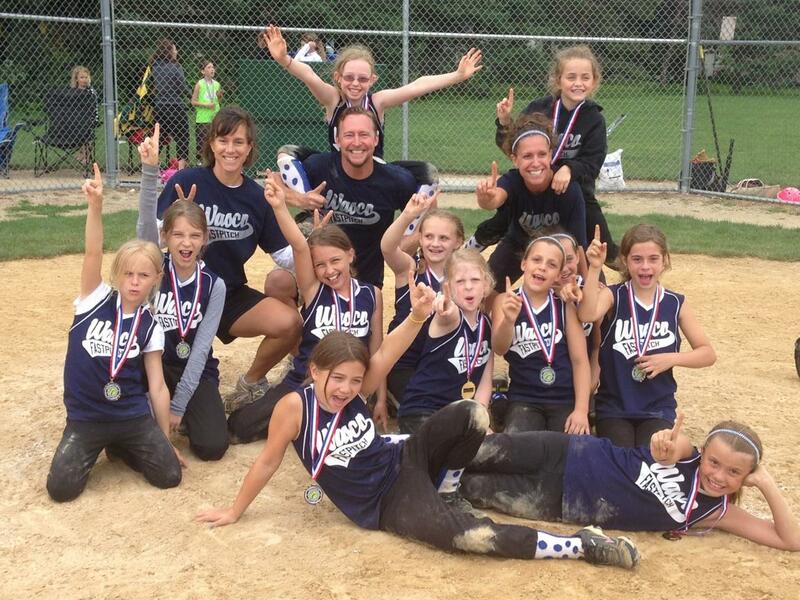 Games are played in the evenings and some Saturdays at our diamonds in NW St. Charles. Practices start in April and conclude late June/early July. We also offer spring clinics and spring pitching/catching clinics on April 7th at Verhaeghe field. In addition to our in-house rec league, we also have All Star teams, the Wasco Warriors. The Warriors not only participate in the in-house season but also in several area tournaments without the year 'round commitment and expense of fulltime travel all the while gaining great experience for the more advanced player. Tryouts are held in August in conjunction with the STC Silverhawks and the College Exposure Dennison teams. Get ready for the season now with clinics through Wasco's partnership with Elite Sports Training Center of St. Charles that includes hitting, skills, and the pitching & hitting clinics. These clinics fill up fast so act now. Click here to register online. Forms must be postmarked by February 16, 2019 5:00 pm or there is a $35 late fee. Completed forms should be sent to: WGFSL, PO Box 343, Wasco, IL 60183. ONLY $150 plus your raffle tickets. This age is instructional. Emphasis is on teamwork and having fun. An 10" Incrediball is used. Players bat until there are 3 outs or the team has rotated through the batting order once. Scores are not kept. The coaches pitch to the girls. A tee is used if the player cannot hit a ball pitched by the coaches. Players interested will learn the mechanics of proper pitching. When in the field, players will be exposed to every position. Games are limited to 60 mins. Items needed: Black uniform pants and black socks are mandatory and can be purchased at the concession stand at Verhaeghe Field or at our On-Line Store. A glove suitable for an 11" softball is required. ONLY $200 plus your raffle tickets. At this level pitching will be performed by interested players. The game becomes more exciting as scores are kept and umpires are used. The emphasis is on learning the rules and all aspects of the game, both offensively and defensively. An 11" softball is used and true fast pitch techniques are taught. The season ends with an in-house tournament. Items Needed: Black pants and black socks are required and can be purchased at the concession stand at Verhaeghe or at our on-line store. Sliding pads and sliding pants are optional. A glove suitable for an 11" softball is required. ONLY $200 plus your raffle tickets. At this level, the game starts to become more competitive as offensive and defensive strategies are taught. Key positions are assigned based on ability. Seven innings are played with both bunting and stealing allowed. Teamwork becomes essential and the girls develop a strong sense of confidence in their abilities. ASA rules are incorporated. Play includes a year-end tournament. Items Needed: Black shorts and black socks are required and can be purchased at the concession stand at Verhaeghe field or at our On-Line Store. Sliding pads and sliding pants are optional. A glove suitable for a 12" softball is required. ONLY $200 plus your raffle tickets. At this level, full ASA rules govern play. The competition level is higher and the action is fast. The girls continue to develop their game while still having fun. Seven innings are played with both bunting and stealing allowed. Teamwork is essential and the girls continue to develop a strong sense of confidence and skill. Play includes at least one year-end tournament. Items Needed: Black shorts and black socks. Sliding pads and sliding pants are optional. A glove suitable for a 12" softball is required. ONLY $200 plus your raffle tickets. YES - you can play both in-house and HS ball. Players just have to wait until their HS season is over. At this level, full ASA rules govern play. The competition level is higher and the action is fast. The girls continue to develop their game while still having fun. Play includes at least one year-end tournament. Items Needed: Black pants and black socks are required and can be purchased at the concession stand at Verhaeghe field or at our On-Line Store. Sliding pads and sliding pants are optional. A glove suitable for a 12" softball is required. Raffle tickets are in packs of 15 and can be sold for $5 each for a total of $75. If you choose to sell them, you keep the money since you've already paid for them or you can keep them for a chance to win $500 cash! There are no other fundraisers! We don't ask that you sell candles or peanuts or magazine subscriptions.